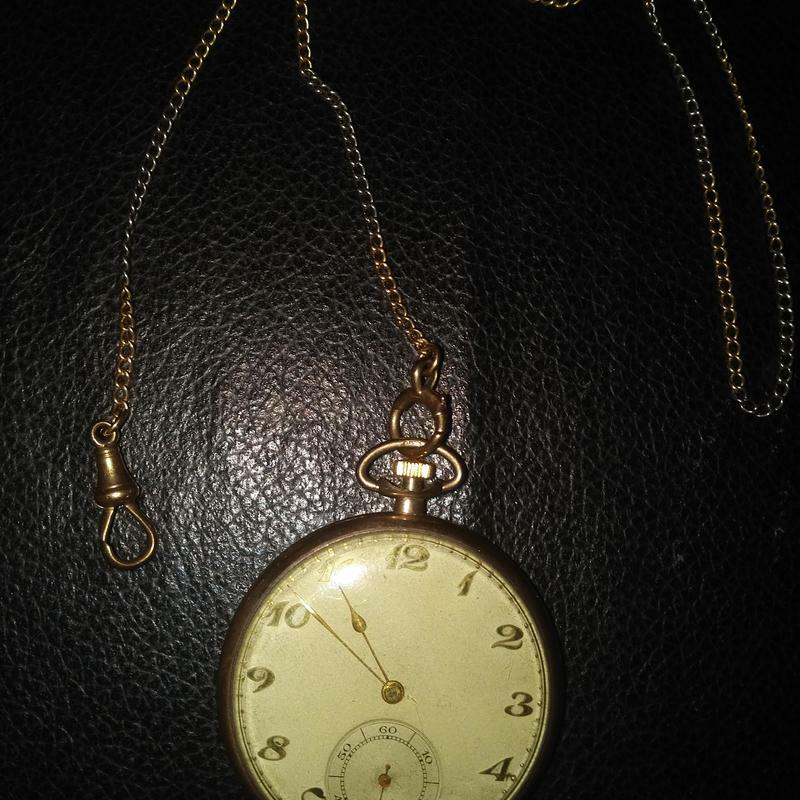 Thank you for sending in your pocket watch to mearto.com for an appraisal. I will do my best to help you with that today. Gent’s 9K yellow gold, keyless, pendant wound and pendant set, open face pocket watch, unsigned, Swiss made movement and case made in England, circa 1930s. CASE: No size provided – most likely a 2 or 3 leaf, 9k yellow gold, open face pocket watch with a fluted flat winding crown positioned at the twelve along with its gold bow. The bow has an English hallmark noted which reads, “9 -.375” (% gold). 9k gold jewelry and watches were very commonly found in Great Britain during the first half of the 20th century. There is a gold-plated watch chain associated with this watch. The watch is very thin and might be a Gruen (Swiss watch maker) product since they manufactured a “Verithin” pocket watch line during the Art Deco years from the 1920 through the early 1940s. The case has not been opened but would have hallmarks inside the cover. . . Dial: Silvered dial with applied gold Breguet hours (Arabic numerals used in the manner of Abraham Breguet, famous early 19th century French watch maker), gold dotted minutes, subsidiary seconds @6 and gilt Continental type Spade hands. Dial is marked, ‘Swiss Made’. . .
Movement: Not shown, most likely a three-quarter split plate movement, fully jeweled (usually 17 jewels) with straight line anchor escapement, exposed crown and ratchet wheels, bimetallic balance wheel and a Swiss made index regulator. The movement would be unsigned and made for export to the English market place. . . Condition: Case – Mild wear to the edge of the case but most of the case is not shown in these photos. Dial: Small hairline fracture running from the subsidiary seconds ring to the dial center and minimal darkening of the silvered dial from oxidation. Movement, not seen, is considered functional. When compared with other similar pocket watches using Swiss movements made to be cased in England, I believe the fair market value of your watch would be $300-$400 at auction today. Retail prices of course would be higher.